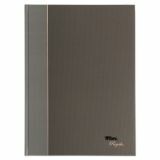 TOPS Royale Business Casebound Notebook, College, 11 3/4 x 8 1/4, 96 Sheets - Sophisticated business notebook features stylish black hard covers, gray spines and metallic accents. Contains 96 white sheets of 20 lb. paper. Each heavyweight sheet is ruled. 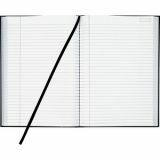 Notebook features a ribbon page marker, personal information page, useful page numbers and contents index for easy referencing. 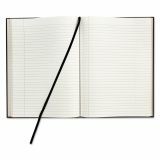 Organize projects by date, page number or name.